Item number 2878/55 from the MOA: University of British Columbia. 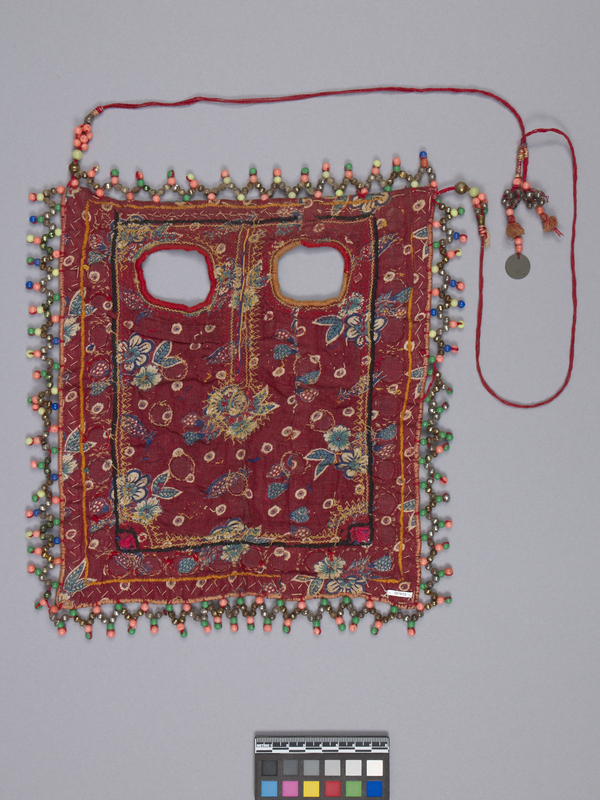 Rectangular, fabric face cover made from a thin, green material that has been lined with a thicker, red floral material. There are two eye holes, one of which has a red embroidered border and the other of which has a yellow and red embroidered border. Down the centre of the cover, between the eyes, a nose-like shape is embroidered that comes halfway down the cover and ends in a circular design. Within the nose-like design there is a red, blue and yellow embroidered pattern. There is a black square border that encloses the eye holes, nose-like pattern, six small mirrors which have an embroidered border, and small embroidered flowers. Outside the black border, on three of the sides, are more mirrors with embroidered borders. Beyond the mirrors, on the outer most borders, there is a wavy white-brown line of applique. There is a beaded fringe around the outer edge of the face cover, consisting of multi-coloured beads in a triangle pattern. At the top of the mask, there are two long red threads that have been tied together. There are beads on the threads where they both attach to the face cover and where thy tie together. 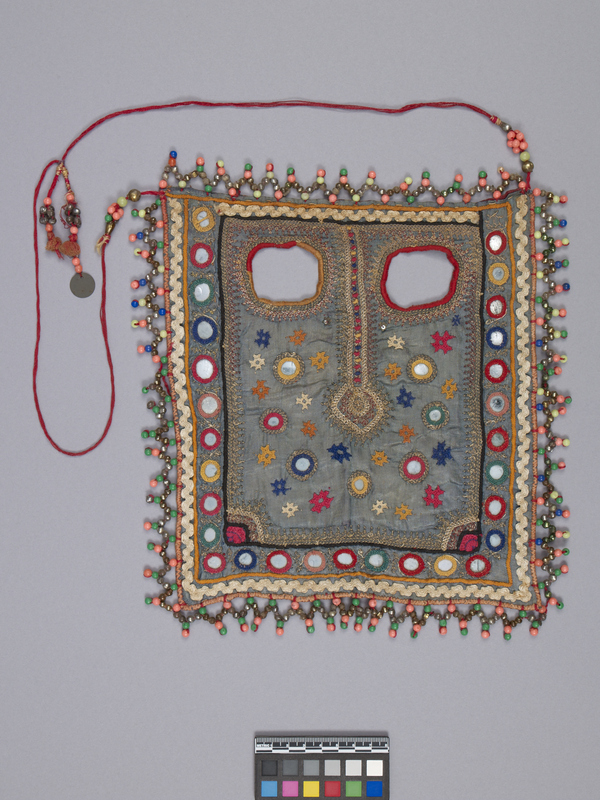 All young Halaypotra women need such a decorative face cover or mask when they become brides so they can continue to respect their custom of purdah (and appear appropriately attired in front of their new male relatives/in-laws) while being the centre of attention at a large public event. From childhood, young girls of the Muslim communities start gathering jewelry and making decorative household articles and clothing for their dowries. Grandmothers and mothers teach their daughters and granddaughters how to embroider and by the time they are of marriageable age, most young women have acquired great stitching skills. This bride's face cover was made by a woman from the Halaypotra community in the Banni area of Kutch District.